Within a week, Mrs. Padmore was mentoring Ethel on Downton Abbey, suggesting that she make salmon mousse for a ladies’ luncheon. -‘But I’ve never made salmon mousse before’ said the hapless Ethel. -‘Anyone with two arms on them could make salmon mousse’ said Mrs. Padmore, refusing to take no for an answer. My third reminder was in the Marks & Spencer’s catalogue of food to order for Christmas and the New Year. Winking at me from page 8, and wearing a badge called ‘NEW’, was a beautifully garnished and photographed salmon mousse which serves eight at a price of €29.50 for 770g. OK, I thought, just do it. I dug out my old recipe and here it is. Blackberries were poor this year. smaller, harder, less succulent, less sweet, less black. Just like every other crop in Ireland this disappointing year. Two weeks ago, we took to the hedgerows on a bright, sunny day and picked our fill. There were rose hips too, sloes and elderberries. Little red ‘blackberries’ which had failed to mature and ripen for want of warmth and sunshine were stunted on the brambles. No doubt the birds will eat them when they’re hungry enough. Our reward was a blackberry and apple crumble that evening, and I froze the rest in 1 lb bags. Part of the celebration of Hallowe’en is taking to the kitchen and baking. A black and orange chocolate biscuit cake is a suitably macabre offering. Hallowe’en. The eve of all hallows – hallows meaning holy. Holy because on that night, after darkness falls, the dead return to visit the living. Oíche Shamhna, as it’s known in Ireland; the night when, in Irish mythology, a portal opens to allow the dead and the living to communicate. Dia de los Muertos is celebrated in the Hispanic tradition too. Chutney. Anglo Irish history in a glass jar. A real ‘come-all-ye’ of a food, made from any and all of the fruits of autumn’s bounty. Apple chutney uses up windfalls. Plum chutney traps the goodness of Victoria plums when there’s a glut. 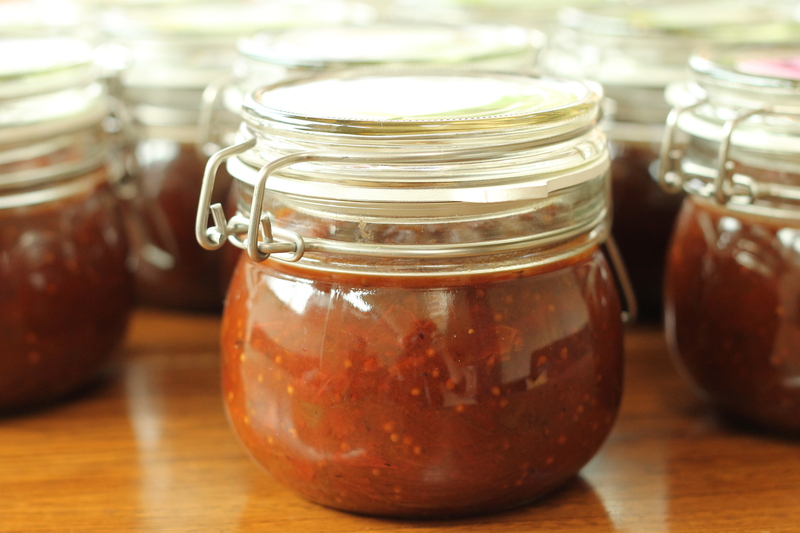 Tomato chutney, green or red or both uses up the last fruits of the season. Several chutneys have a bit of everything in them. Waste not, Want not. Yesterday I made large pot of Hearty Lentil soup. A Soup for our Times. Low cost, nourishing, filling, tasty, low glycaemic index. Perfect for a cold, rainy day. Ideal to take to school or to work in a Thermos. I got this recipe from my neighbour, Ann Quinn who runs cookery classes from her home in Dublin 9 and has allowed me to share it. Her company is called The Boston Dinner Party. Over the past two decades she has taught men, women and children in our neighbourhood (and beyond) how to cook for any occasion, and we’ve all reaped the benefit! Ann recommends this soup for all occasions. Ready in under an hour, it requires no skill beyond chopping an onion. It’s great for lunch or dinner, and keeps hunger at bay for weight watchers. When any of our neighbours experience an upset or a loss, Ann’s been known to turn up quietly bearing a large pot of Hearty Lentil Soup. People who get so distracted that they think they’ve no appetite, will still reach for a comforting mug of soup to keep body and soul together. Mix together all the ingredients in a very large saucepan, Cook over a medium heat, stirring occasionally, for about an hour. Add more water if it becomes too thick. This is particularly tasty served with a dollop of creme fraiche and some chopped dill. Cook’s Note: the flavour of cumin is enhanced by roasting it. 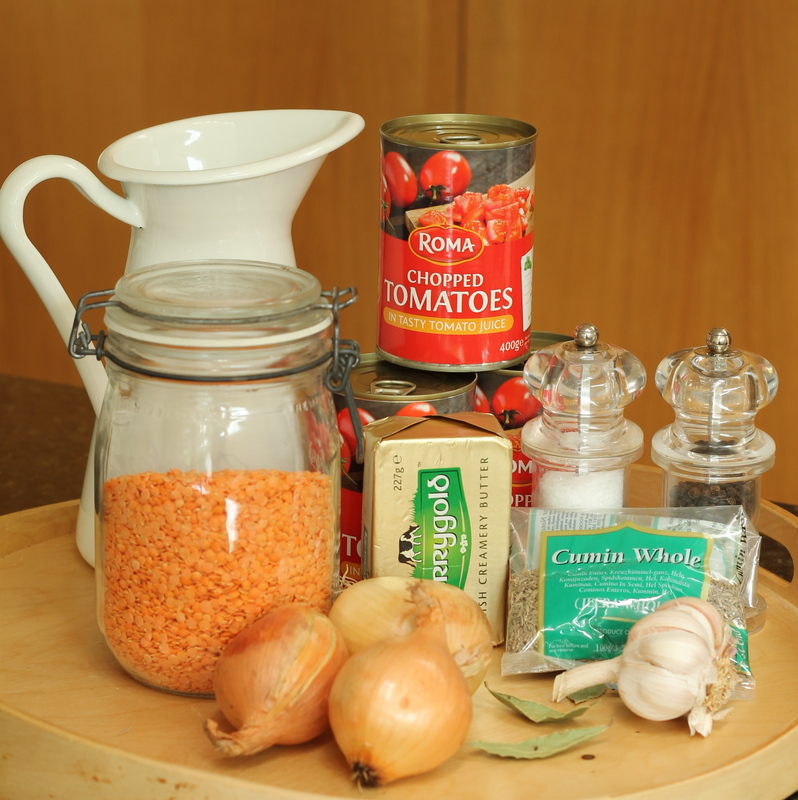 Keep a jar on hand to add to some soups and casseroles. Simply pour some cumin seeds into a dry frying pan and cook over a medium heat for a few minutes. You’ll know when it’s roasted by the aroma that fills the room. Allow the seeds to cool, then grind them to a powder with a pestle and mortar. Lentils; contain carbohydrate with a low glycaemic index. This means that they are a slow-burning fuel and less likely to cause weight gain. They contain a substantial amount of protein which makes you feel fuller for longer. They contribute small amounts of Vitamin B, especially B1, and of essential minerals. Some people find that eating pulses causes flatulence. Soaking them before use, and changing the water, can help. In general, if you get into the habit of eating pulses regularly, your digestive system (the friendly bacteria in the gut) will adapt within a short time. Eating slowly is also a help to digestion. Tomatoes: canned tomatoes are harvested in the southern Mediterranean region at the peak of their freshness. 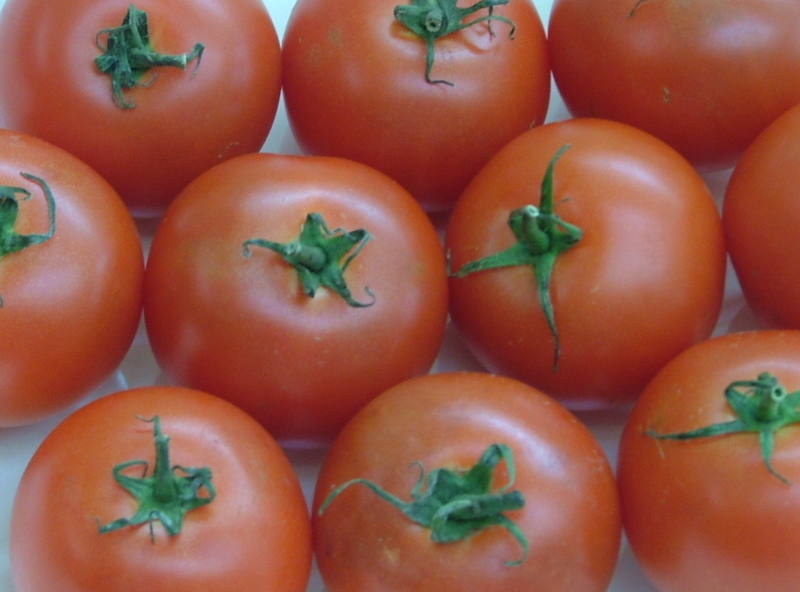 They have a little less Vitamins A, C and E than fresh tomatoes, but have more lycopene, a naturally occurring antioxidant known to protect against several cancers. Onions and Garlic: renowned for their health-giving properties, these are rich in Vitamins B,C and essential minerals. They contain several phytochemicals (naturally-occuring plant compounds) known to offer protection against infections and to help in tissue repair. Onions are a good source of low glycaemic index carbohydrate. Butter: rich in vitamins A,D,E,K, and the trace element Selenium, butter offers omega-3 and omega-6 fatty acids along with Conjugated Linoleic Acid all of which have strong anti-cancer properties. Cumin: when roasted and ground, cumin seeds release an aromatic oil which makes digestive juices flow, and help ease digestion. Ann Quinn is holding cookery classes at her home in Drumcondra/Glasnevin for children and teenagers during the Hallowe’en break next week. You can reach Ann by e-mail at bostondinnerparty@gmail.com to make enquiries about these, and a range of adult classes. We live in a time when everyone needs to know how to cook substantial, nourishing food at home and to make sensible home economies. Learning how to cook is not only a basic skill for survival, it’s an absolute joy- especially in Ann’s kitchen. Good health begins with breastfeeding. 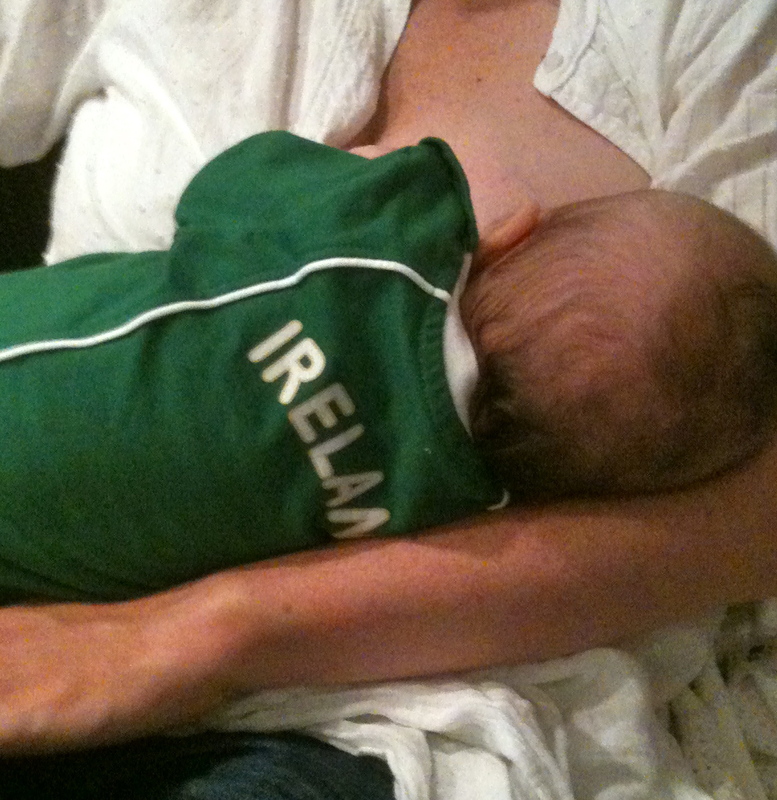 As it’s National Breastfeeding week, I thought I’d share a picture of my favourite breastfed baby with you. 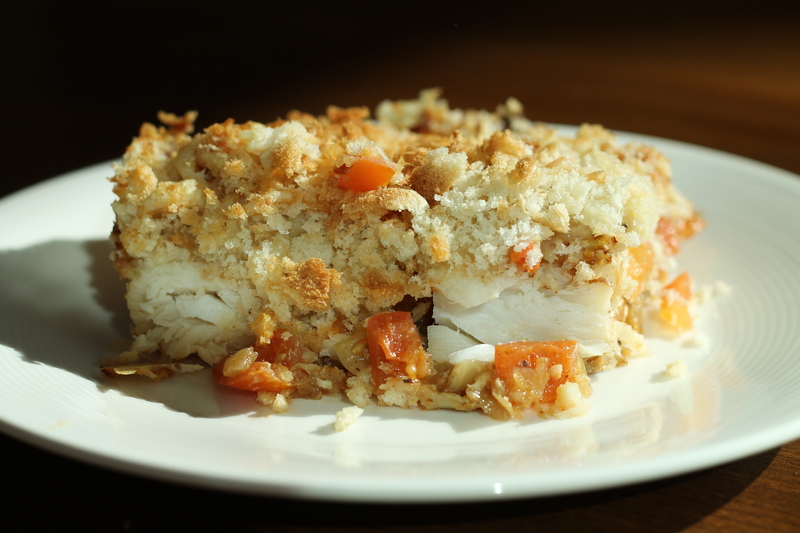 I had almost forgotten that this fish pie from Darina Allen was a family staple when my children were growing up until it was requested recently. Like most households, our kids ate fish without comment until they went to school and began succumbing to the peer pressure of friends who wouldn’t touch it. We began hearing about fishbones and fear and “I don’t like it”. Some strategic thinking was required. I decided to make a fish dish for dinner on the day they had swimming class, and that it would be ready before we came home, starving. It worked! As we walked through the door, the smell from the pre-set oven would greet us and by the time the togs and towels were hung up and the table set, dinner was ready. Once the precedent was established, we moved from the various fish pies onto other fish dishes, but this one was the pioneer, the fish pie that broke the mould. Summer holidays are over; children and teachers have returned to school. My stockpot is ready. Many of us will have begun a head cold by the Equinox on September 21st. While we might like to blame the disappointing Irish summer, the truth is that whether the summer is good, bad or indifferent, viruses that cause the common cold outsmart us all every September. So now’s the time to reach for your stockpot, a good free-range, preferably organic chicken and lay in your supplies for when the sniffles arrive in your house, as they inevitably will. 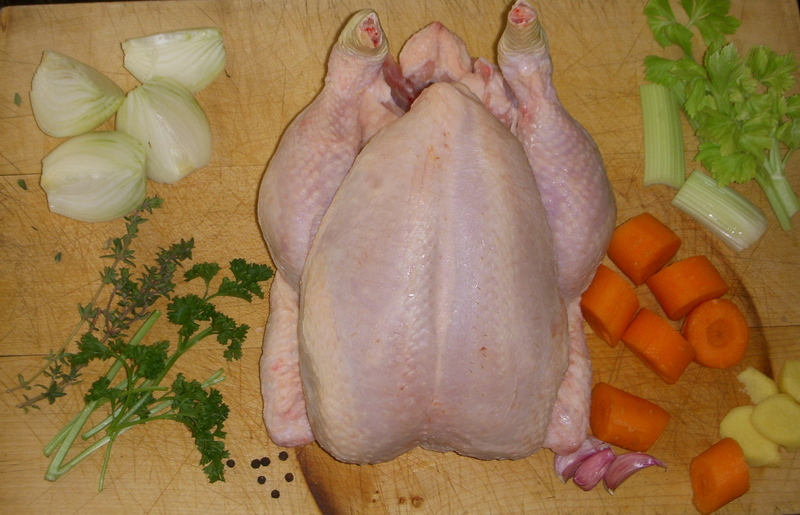 You’ll end up with a lot of chicken meat which you can freeze in 100g/200g parcels for school lunches, and with chicken stock which may be frozen in small, medium or large quantities. This takes a few hours to do so prepare it ahead, for when you’ve a miserable child draped over your shoulder. Irish Tomatoes are in season at last. The shops are full of them and those who grow their own are reaping the harvest. 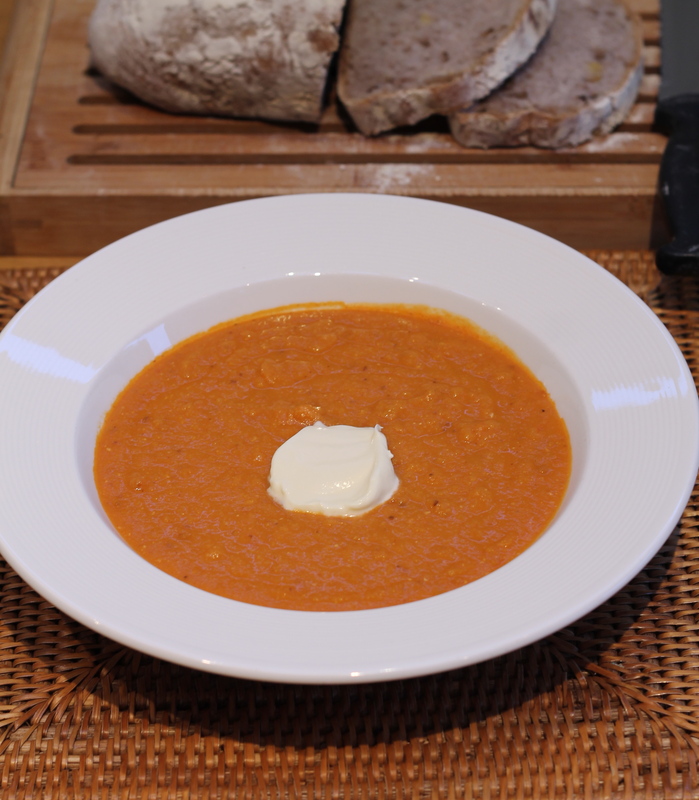 Gazpacho Andaluz is one of the best and tastiest ways of using them. A salad in a soup bowl, it transport you to the Mediterranean and bursts with nutrition. Last week when summer weather paid us a rather late visit, I made a gazpacho using Marguerite Costa’s recipe in my 1970 copy of her ‘Four Seasons Cookery Book‘. It was SO tasty. Eating it al fresco with bare arms was a delight. We enjoyed the occasion so much that I forgot to take photos of the terracotta-red soup in its large tureen accompanied by pretty bowls of garnish in red, yellow, green, black, gold. Well, if Mrs. Costa could present her wonderful recipe in a book without pictures and make it in a time when she had no electric blender, only a Mouli, you and I can use our imaginations and blitz it in a jiffy.